Dominic D'Arcy, singer, entertainer, musician, actor and former police officer has thrilled crowds around the world with his unique blend of music/comedy for over four decades, from China, the former USSR and most parts of North America as well as the Caribbean Islands and has been on stage since he was 14 years old. Dominic also performs in six languages. This 3 time Governor General's Award Recipient, presented with the Key to the City of Ottawa May 2006. He has had his music played on radio stations across Canada, Europe, Australia and most parts of the USA. He also had his own award winning TV show called "D'Arcy's Beat" for five seasons. 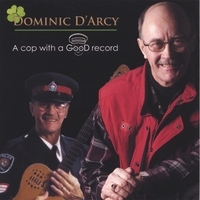 Sergeant D'Arcy has now retired (contracted) from the Ottawa Police after thirty six years of service and affectionately known as the "Singing Policeman" is stepping up to the plate once again hoping for a home run with his new release which will be his 20th and feels is his best work so far. Dominic has nurtured and mentored several young performers through his "Rising Stars Prgoram", one of which was Alanis Morisette. Dominic finally made it to the red carpet in Hollywood for the World Premiere Screening of "Light Years Away", a movie in which he played a part of a police officer.